A formidable mix of power and portability. NVIDIA CEO Jensen Huang flaunted a Gigabyte Aero 15X at CES as to show how Max-Q tech can make laptops both light and powerful. With the updated 2018 Aero 15X, Gigabyte has shown it's not just about the graphics. It features an all-new eighth-generation Intel 6-core CPU and with a new 144Hz display, addresses the last model's biggest shortfall for gamers. At the same time, it retains the clever design, NVIDIA GTX 1070 Max-Q graphics and huge battery, making the Aero 15X the best lightweight gaming laptop you can buy. That said, there are a host of similar laptops coming soon, so Gigabyte might not retain its crown for long. The Aero 15X was already the most capable lightweight gaming laptop you could buy, but Gigabyte made the latest version even better. 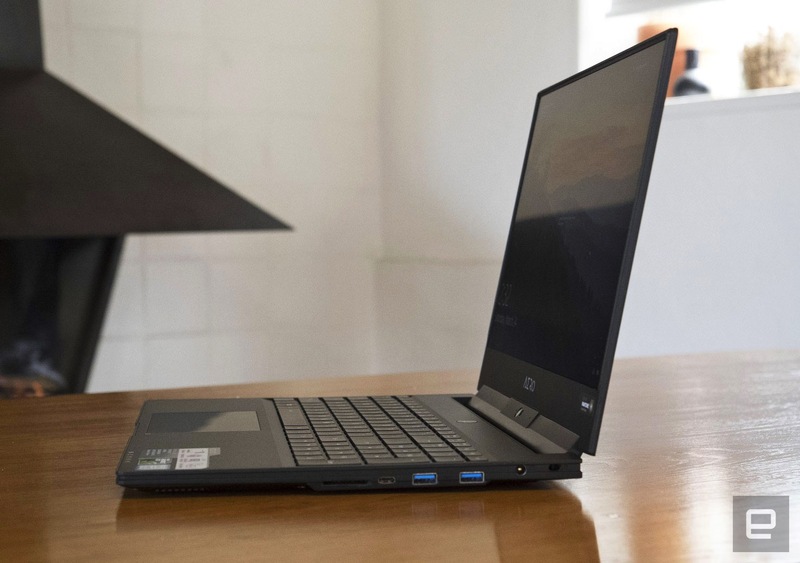 With an all-new 6-core Intel processor and gaming display, it offers a rare blend of performance, portability, and battery life that blows away rivals. 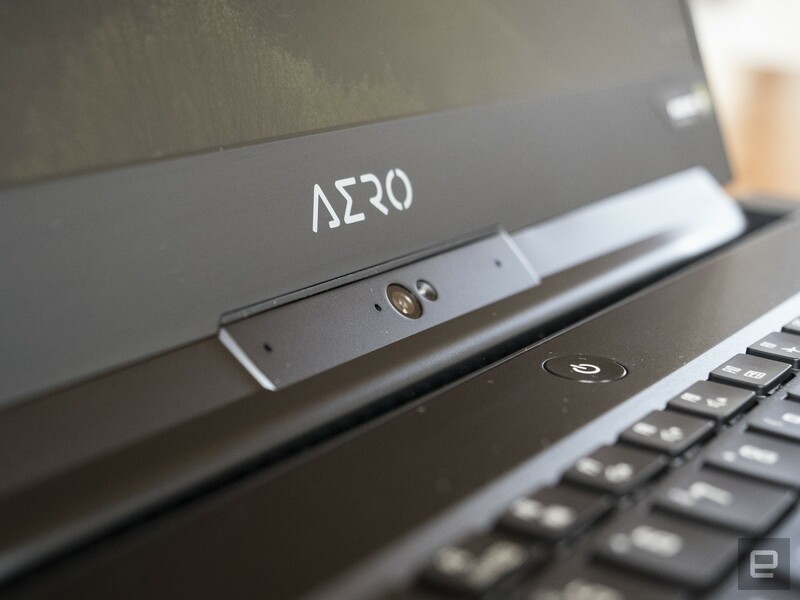 Be the first to review the Aero 15X (2018)? 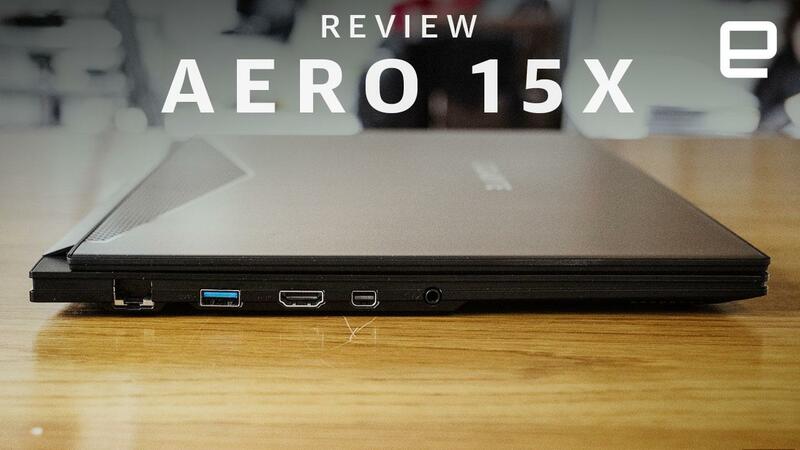 Gigabyte didn't mess with the design of the original Aero 15X, other than replacing the "Gigabyte" lettering on the screen with a fancy new "Aero" logo. It also kept the brushed black aluminum chassis, port layout, weird webcam and everything else external. Since the last model had a near perfect blend of power, weight and battery life, it's easy to understand why it stayed the course. Some may call the design bland, but I like that it has Superman-like power under a Clark Kent exterior. 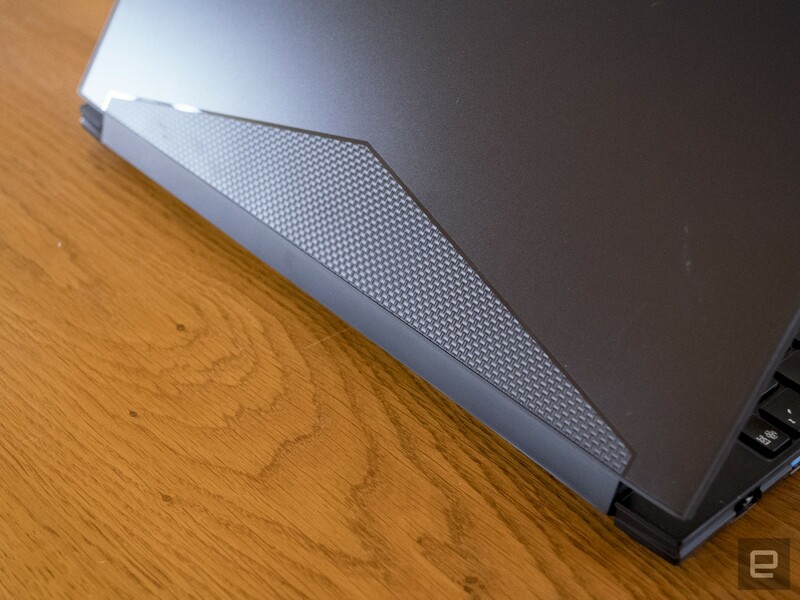 At 18mm (0.7 inches) thick, it is about as thin as its key lightweight gaming laptop rivals, the MSI GS63VR 7RG Stealth Pro and ASUS ROG Zephyrus GX501. It's a bit heavier than the 4.2-pound MSI, weighing 4.5 pounds, but much lighter than the 4.9-pound ASUS. Suffice to say, it's thin enough to put in my Peak Design shoulder bag and light enough to carry around without breaking my back. I'm picky about keyboards for speed typing, but fortunately the Aero 15X has one of the best I've tried, thanks to the slightly concave keys, short travel and satisfyingly solid rebound. As before, it's backlit with Gigabyte's Fusion tech, which lights up each key individually with up to 16 million colors -- the laptop's only bit of gaming flash. Like on many other Windows 10 laptops, the touchpad on Gigabyte's flagship is just okay. The level of friction is good, click pressure isn't too heavy and tapping works well. However, it occasionally mis-detected my palm, and doesn't support three- or four-finger Windows 10 gestures used for summoning Cortana and other functions. Gamers and serious graphics users will want a mouse, but the touchpad will at least do in a pinch. The system also features a pair of 2-watt speakers with Dolby ATMOS for gaming. The quality of the sound, alas, isn't quite worthy of the name, as the Aero 15X, like many laptops, lacks anything approximating bass. The rest of the frequencies, at least, are crystal clear, and the stereo separation is better than average. The standout design feature is the near bezel-less 15.6-inch display. 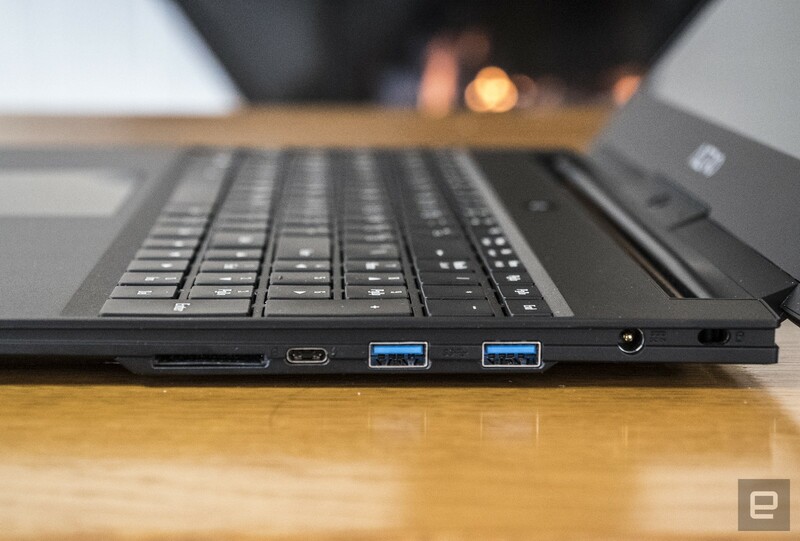 On top of looking good, it keeps the Aero 15X's size about the same as many 14-inch laptops. It also helps explain how Gigabyte was able to fit so much power and battery life into such a small chassis. The downside to these small bezels is that the 720p webcam is mounted on the hinge, creating a very unflattering angle for Skype calls. In any case, the 1080p IPS display is fantastic. It now has an excellent maximum 144Hz refresh rate, which is a big step up from the 60Hz screen that disappointed gamers on the last model, although it's still lacking NVIDIA G-Sync support, unfortunately. For graphics users, it packs X-Rite Pantone tech, meaning colors are factory calibrated out of the box. Gigabyte's last Aero 15X was already near the top of the performance charts thanks to the Intel quad-core i7-7700HQ processor and NVIDIA GTX 1070 Max-Q graphics. The latest model takes it to another level, though, via Intel's freshly-announced 6-core i7-8750H CPU. Gigabyte has promised up to 50 percent more processing grunt, and my tests bear that out, showing a CPUMark score of 12,500, compared to around 8,900 on the older model. As a reminder, Max-Q cards are a bit slower than the non-Max-Q versions, but more battery-friendly. So, you'd expect the new Aero to pack more power than an NVIDIA GTX 1060 laptop, but less than one with a GTX 1070. Sure enough, it falls just short of the Alienware 15 in the 3D Mark 11 test suite, and sits another notch below the aforementioned ASUS ROG Zephyrus. However, it smokes models like the Alienware 13 and latest Surface Book, both of which pack the GTX 1060 chip. Performance is closer to the GTX 1070 than the 1060. To see how the Aero 15X handled games, I tested Witcher 3, Wolfenstein II and Rise of the Tomb Raider. At 1080p, it handled all of those games incredibly smoothly, hitting 120 fps on Rise of the Tomb Raider -- just a smidge below the GTX 1070-equipped Alienware 15. Even on a 4K monitor, the frame rate on Witcher 3 was well over 30 fps, more than acceptable for a laptop so small. The Aero 15X has dual fans and two pipes that protect the GPU and CPU from overheating, along with a side air vent to prevent recirculation. However, when gaming, video editing or running an external 4K monitor, the fans crank up and get pretty noisy. During normal use they rarely come on, though, and when they do, the sound is not obnoxious. Most importantly, parts get warm but never hot to the touch. In Gigabyte's Smart Manager, you can even tweak the fans for quiet, normal and gaming operation. The Aero 15X's superpower is its battery life. It lasted a stellar 7:40 in our battery rundown test, nearly long enough to let me continuously watch movies on a Paris/Vancouver flight. That's about twice as long as the latest GS63VR 7RG Stealth Pro and, miles ahead of the ROG Zephyrus. How did Gigabyte pull this off? For one thing, the Aero 15X packs a massive 94.24 Wh battery, almost double the 50 Wh unit in the ASUS ROG Zephyrus. It also offloads video playback chores to the integrated Intel UHD 630 graphics, keeping the more power-hungry GTX 1070 idle. You can expect a lot less battery life while gaming, of course, but considerably more than rivals. Again, as with other laptops, I'd expect considerably less battery life with the 4K display option. The Aero 15X starts at $2,200 with a 1080p 144Hz display and Windows 10. Stepping up to the 4K screen and Windows Pro will cost you $200 more. 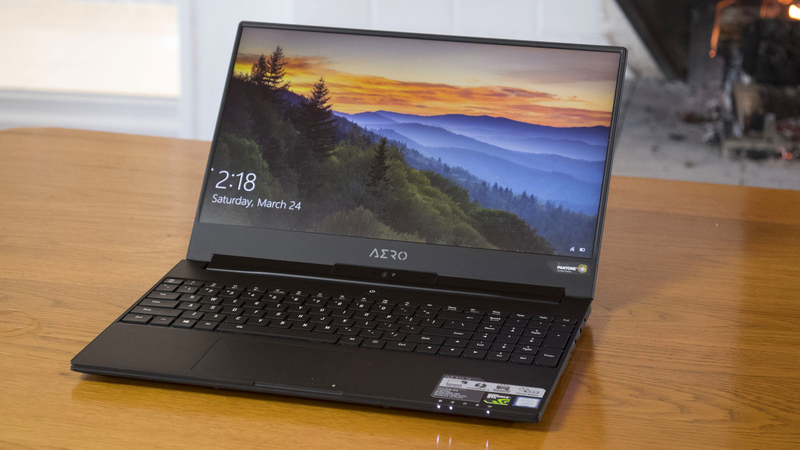 It's also launching the slightly de-tuned Aero 15 with the same Intel i7-8750H 6-core processor and still-excellent NVIDIA GTX 1060 graphics, starting at $2,000. You can get up to 32GB for the Aero 15/15X, and I'd recommend you do just that if you plan on doing graphics work or heavy gaming. Frankly, 16GB just isn't enough anymore for power users, thanks to memory bloat in many apps, especially browsers like Firefox and Chrome. I found that Premiere Pro 2018 CC, another memory hog, used nearly 10GB of RAM at times. At $2,200, the Aero 15X will be competitive with the aforementioned MSI GS63VR 7RG Stealth Pro ($2,400) and $2,300 ASUS ROG Zephyrus equipped with full NVIDIA GTX 1070 graphics. If you're willing to step down to NVIDIA GTX 1060 graphics, however, the Razer Blade is now considerably cheaper at $1,700. With Gigabyte's refresh of the Aero 15X, it now has few faults, blending class-leading performance, portability and incredible battery life. It also has a wide range of ports, an excellent keyboard, and finally, a fast-refreshing 144Hz screen better suited for gaming. However, a better touchpad would have been nice, and the minimalistic design won't thrill those who want their gaming laptops to look the part. As someone who also does a lot video editing, compositing and 3D animation, graphics performance, weight and battery life are all paramount for me. I recently covered the Geneva Motor Show, and needed something reasonably light with enough power to edit 4K video and sufficient battery life to go most of the day. That's another use case where the Aero 15X really shines, providing all three of those things at once. For people like me, the excellent gaming performance is just a bonus. All that said, with the launch of Intel's new high-performance laptop CPU's, a wave of lightweight, powerful laptops arrived this week from ASUS, MSI, Samsung and others. The new ASUS ROG Zephyrus M laptop, for instance, has nearly identical specs to the Gigabyte Aero 15X, with the same eighth-gen Core i7 CPU, GTX 1070 Max-Q graphics and 144Hz screen. The same goes for MSI's GS65 "Stealth Thin" laptop, so Gigabyte has a lot of high-powered competition incoming.